This Take-Three Tuesday we tried deli salads recommended to us by our Facebook group as being great deli salads available at local grocery stores. To get a cross section of tasters, we brought six deli salads to a campground and did a blind tasting with ten campers. The salads were all purchased the day before. One salad was the clear favorite. Two others were liked by all. One salad we purchased at O &H we took out of consideration because (a) we didn’t think this was the same salad as the page member recommended and (2) the salad didn’t taste fresh after a day. That left us we five salads: two from Festival Foods, two from Tenuta’s and one from Danny’s Meats. These three were our favorites. Sombrero Salad, Festival Foods, regular price $4.99 lb. Festival Foods strong point is their deli section. Their prices for other staples may be higher than pick-n-save but their salad, hot food, dip, cold dessert selection is phenomenal. The Sombrero Salad was enjoyed by all of our tasters. Black olives, shredded cheddar, rotini and a dressing that reminded me of a thin Catalina dressing with a touch of taco seasoning. A solid salad-its not going to set the world on fire with its exotic ingredients-but its a crowd-pleaser. Tortellini Salad, Tenuta’s Deli, 3203 52nd Street, Kenosha, reg. price $4.99 lb. The ingredients in Tenuta’s tortellini salad were about as good as you can get. First the cheese tortellini was soft but not too soft. The large chunks of salami were not too spicy and surprisingly tender. The chunks of cheese were also quite generous. The price, $4.99 a pound, is very reasonable given the high quality ingredients. The only change may be to add a little Italian dressing to it when you serve it a second day as the pasta had absorbed much of it. This may be why someone suggested that you purchase Tenuta’s Olive Salad and then mix the two together — going to have to try this. Spinach Pine Nut Salad, Festival Foods, regular price $6.49 lb. The other two we tried were Tenuta’s Supper Salad (kind of plain and under-dressed) and Danny’s Meats Jalapeno Potato Salad (too spicy and too many crunchy vegetables for most of us). Its hot and there is sooo many things to fill your time in Wisconsin during the summer. Cut some of the hassle by picking up one of these salads for your next party. One of my absolute favorite classic sandwiches is the good ole’ club. And let me tell you, if it isn’t cut in four pieces with tooth picks holding it together (preferably with plastic colored pom pom things on the end), I get sad. We had two decent clubs and one very good club in this Take Three Tuesday go-round this week — on to the results. Water Street Brewery in Oak Creek is a humongous restaurant with a very large menu. Saturday night was hoppin’ with customers which is a good sign for the many new restaurants to come in Drexel Town Square. Water Street’s Club ($10.95 including a side) was generously made with turkey breast, ham, bacon lettuce. tomato, cheddar cheese — all traditional ingredients — with one exception, chipotle mayo. I love a new twist on an old classic, but this one didn’t work for me. Maybe an herb mayo, or a ranch mayo — chipotle mayo just seemed out of place. Also, they didn’t put enough mayo on the sandwich and tasted if it was toasted a while ago. No complaints with the size, meat or other ingredients though. If I ordered it again, I would simply substitute regular mayo – and use a heavy hand. Our No. 2 club sandwich was in Kenosha. I was a first timer at this little soda fountain inside a gift shop in the heart of Kenosha. Not a lot of seating, but this place was cute as can be. I was shocked how busy the shop and restaurant were on a Wednesday afternoon. We ordered Jack’s Club for $8.25 which came with chips. Jack’s club was LOADED with meat, they certainly did not skimp out. However we had two somewhat minor issues with the club. First, they did not put mayo on the club, they served it on the side. It was kind of a pain to spread mayo on the club yourself and spread it on the bread without messing up the sandwich. Second, the sandwich was so loaded with meat and bottom heavy that the top part had a tendency to fall off. Maybe the two meats should be spread evenly throughout the sandwich for ease of eating. 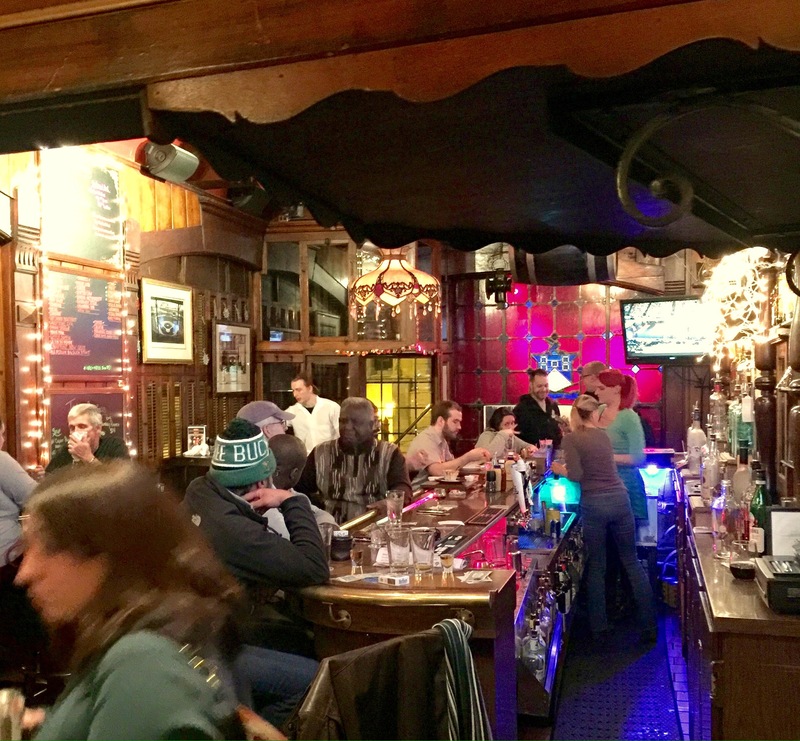 Ivanhoe is a bar that serves great food, and its clear that whomever is designing the menu has made efforts to be creative and give Racine something more than typical “bar food”. We ordered the Turkey Club for $9.00 which came with a side – we got the fries. The club was very good and what put it ahead was the toasted, buttery, bread, the fresh-tasting turkey and the Swiss cheese. I also liked the thinly-sliced onions — not typical for a club but it worked. Next time, give us enough fries to finish that ketchup though. We asked our members to suggest “off the radar” burgers in Racine and Kenosha and our Facebook group delivered — over 100 places were suggested. We couldn’t just limit our review to three places — we hit nine and gave ourselves a little extra time to do it. Even with trying nine burgers, not one of these places was a strikeout. Clearly every one of theses places cared about putting good food out to their customers. The five places below are not our winners but we gotta say, they were still pretty good. Suds and Grub, Husher Pub and Greg’s Catering were decent burgers, but our winners just had something slightly extra special. Danny’s Meat Market and Cabbage Heads were good flavored burgers, but the burger was overcooked — next time it could be cooked perfectly, who knows. Choo-Choo Charlies is off everyone’s radar currently because it is so new. Unlike all of our other picks, the atmosphere is train-crazy, loud and geared towards kids — no beer here. It made the top of the list because the burger is darn good and the price is reasonable. The buns on Choo-Choo’s burger were wonderfully crunchy – reminded me of the old Pinocchio’s. This wonderful burger was $6.49 and that included fries. Grab your kids and go, you don’t have to sacrifice tasty food to eat at a place your kids will love. Buckets Pub – 2031 Lathrop Avenue, Racine, Wisconsin. www.buckets-pub.com. Buckets is certainly not off the radar for Racine folks. — everybody knows about their hot wings. However, you don’t hear a lot of talk about Buckets burgers. We ordered the cheeseburger (only half-pounders served here) for $7.95 with cheddar and comes with fries. Out of all the places we visited, Buckets was the only place that asked how we want our burgers cooked — medium rare please. As requested, the burger was cooked a perfect medium rare with a classic beefy burger flavor. No special sauces, avocado or fried egg topping available – just a juicy traditional burger. I would eat this burger instead of wings any day. The Garage, 3001 60th Street, Kenosha, Wisconsin. www.garagebarkenosha.com. The Garage is a bar and burger place, but it is new and not yet on everyone’s radar. We ordered a egg-topped cheeseburger and a cheddar-stuffed burger topped with bacon and grilled onions for $11. With the burger came your choice of kettle chips or seasoned hand-cut fries. The meat was seasoned perfectly and the burger cooked perfectly. Bonus for interesting toppings that added to the burger without overwhelming it. This is a bar on a small street in the Uptown area of Racine that you would never find if you didn’t make a special effort to go there. Don’t give up though, you will be missing an excellent burger. Uptown pub has a few tables, a few tvs, but by and large this is a bar – probably not a place to bring your toddler. Uptown offers build your own burgers – 1/3 lb grilled for $6.50 and a stuffed burger or $7.50. We had one of each – Bacon cheese burger and a Stuffed blue cheese burger with swiss and grilled onions. The burger tasted just as delicious as it looks in the photo. Pink in the middle, great bun, perfectly cooked bacon and cheese. The chipotle mayo was a perfect addition to the typical bacon cheeseburger. The stuffed burger with blue was transcendental — the blue cheese melted in the middle into like a creamy sauce. (The picture I had didn’t really do it justice so I omitted it) Paired with the bacon and the grilled onions — hot damn! I suspect we will do an off the radar burgers round two sometime in the future, but for now, I need some celery sticks and wheat grass shots. Well, maybe for a day or two. We sampled cupcakes this week for our latest Take Three. We all love the top of the cupcake, but when I get to the bottom, it seems like wasting calories to eat the dry cake. I was hoping to find cupcake to enjoy all the way through. Coming in at Number Three: Honeypie Cafe, 2643 S. Kinnickinnic Ave, Milwaukee, Wisconsin – open seven days a week. Honeypie is a small restaurant/bakery in the Bay View section of Milwaukee. Honeypie has a glass case with baked goods and there were about six flavors of cupcakes. We chose the Chocolate Strawberry and the Mexican Chocolate. The chocolate strawberry was moist with a strawberry center. I wasn’t in love with the strawberry filling, but others liked it. The chocolate cake was missing the density that I craved. Unfortunately, the Mexican Chocolate must have been sitting for a few days because the part of the top that was unfrosted was hard. SweetEats is a stand-alone location that offers the largest selection of cupcakes of any of the places we visited. Although the cupcakes were slightly smaller, they were the most reasonably priced of the three places. There are a couple tables inside, but I suspect most people get their baked goods or food to go. We ordered the Better than Hoho cupcake, the Banana Cream Cheese Cupcake (not pictured) and the Peanut Butter Puff. I loved the Better than Hoho and the Banana Cream Cheese cupcakes. First, the light but sweet frosting was perfect for the Better than Hoho. Like a Hoho, the cupcake was filled in the middle with frosting. The banana cake cupcake tasted exactly like banana bread. This would be my flavor choice for cupcakes. The only thing I wished was that the bottom cake had a tad more moisture and density. This is why SweetEats did not come in at No.1. Coming in at number one…. This restaurant/bakery/coffee shop/beer seller was HOPPING! I have no idea how these people even knew about the place because the signage was non-existent. The Buzz does not offer a wide assortment of cupcakes. When I visited, there were only two available; the Red Hot Chocolate Chili Cupcake and the Pink Velvet Champagne Cupcake. The Red Hot Chocolate Chili cupcake is not for everyone, myself included. I don’t like cinnamon red hots. The Pink Champagne was nice, but probably wouldn’t have been my choice if there was another flavor. The reason the Buzz Cafe is our winner is that the cake part is dense, moist and had a perfect texture. Everyone that tried it agreed: We may not love the flavor, but the cake part is great. The Red Hot cupcake was freshly made and the pink velvet champagne was a few days old, however both cakes tasted equally as fresh. I just wished they would offer an everyday common flavor in addition their new interesting flavors. They seem to post the available cupcakes on their Facebook page if you want to check it out. Whomever makes the cupcakes at the Buzz Cafe is doing something right, but the flavor selection is limited. If you are getting cupcakes for the office or a party, Sweet Eats is the place to go. *sigh*… I don’t even know where to begin with this week’s Take Three Tuesday. I was REALLY looking forward to sampling beer-flavored, cheesy goodness and ranking them, but, unfortunately, I cannot recommend two of the three soups that we tasted. 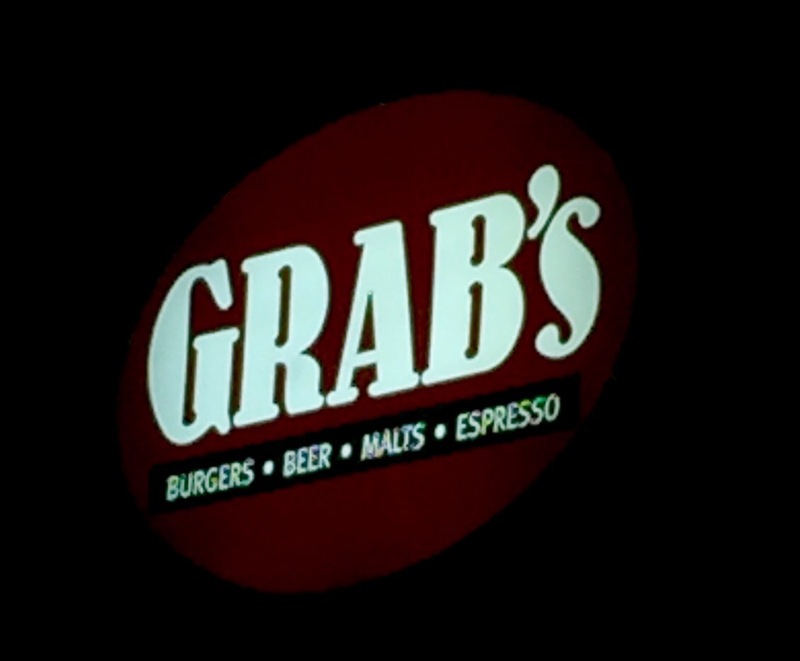 I really like the burgers and fries at Grab’s. And I love their maple bacon shake so much, I would totally marry it. 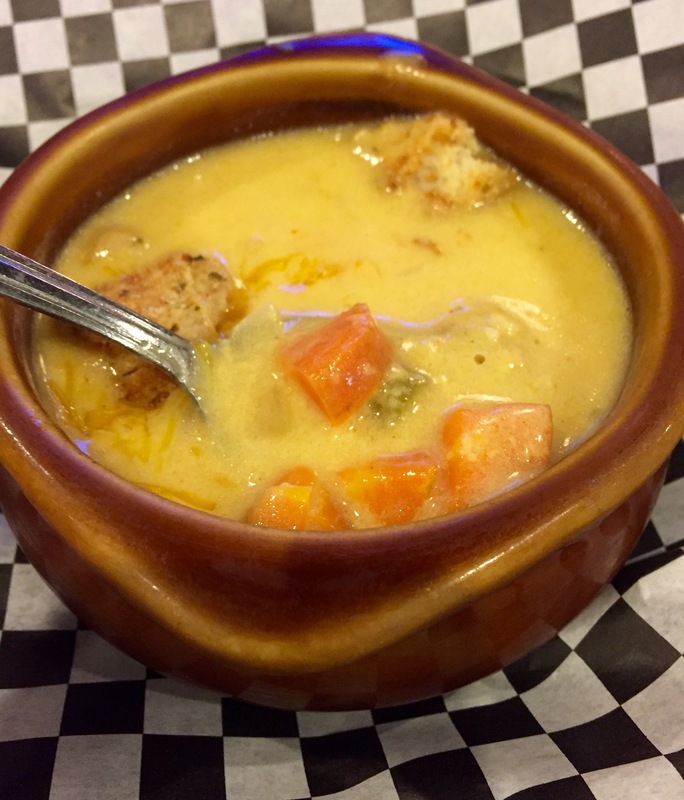 But we went there to try their Wisconsin Beer Cheese Soup as recommended by our page members, and I was let down. The bacon crumbles were nice, and the popcorn added a pleasing crunch. But the consistency… UGH… almost like slightly melted peanut butter or wallpaper paste (Yes, it was that thick!). Whats more is that it had a grainy, mustard-like feel in my mouth — I just could not get past it and I cannot recommend this soup. 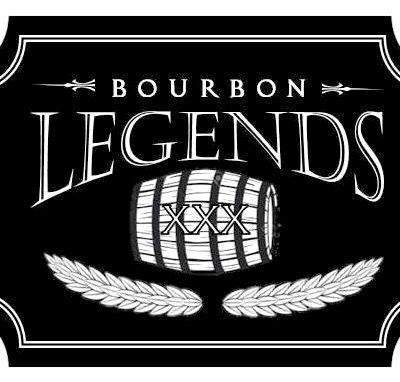 This was our first trip to Bourbon Legends, and I wasn’t very impressed. I ordered a dirty martini on the rocks when we walked in, and the bartender asked me to explain to her how to make it (not a good sign, especially with a very uncomplicated drink like a “dirty”). Things can only go up from here, right? Wrong! 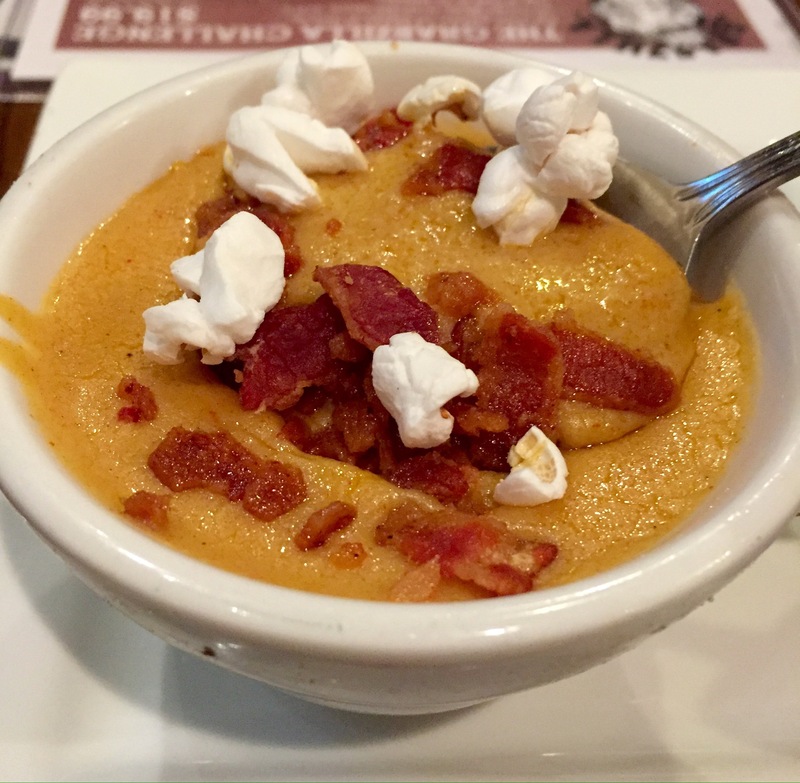 First, the Wisconsin Beer Cheese Soup at Bourbon Legends was downright watery, and so was the flavor. Second, the chunks of carrot and celery in the soup were basically raw; as if they were added as an afterthought. The one bright spot was the the homemade croutons. Are we catching everyone on a bad night? Maybe… But if that’s the case, then there’s a big problem with lack of consistency at those two spots. From what I can tell, Wells Brothers doesn’t have one particular way they make their Beer Cheese Soup. Looking at their Facebook page, I noticed “cheesy beer”, “cheddar ale” and “cheesy beer brat chowder” listed on their daily soup menu (changes daily). When we stopped in, it was Cheesy Beer Bacon & Jalapeño — and it was good! 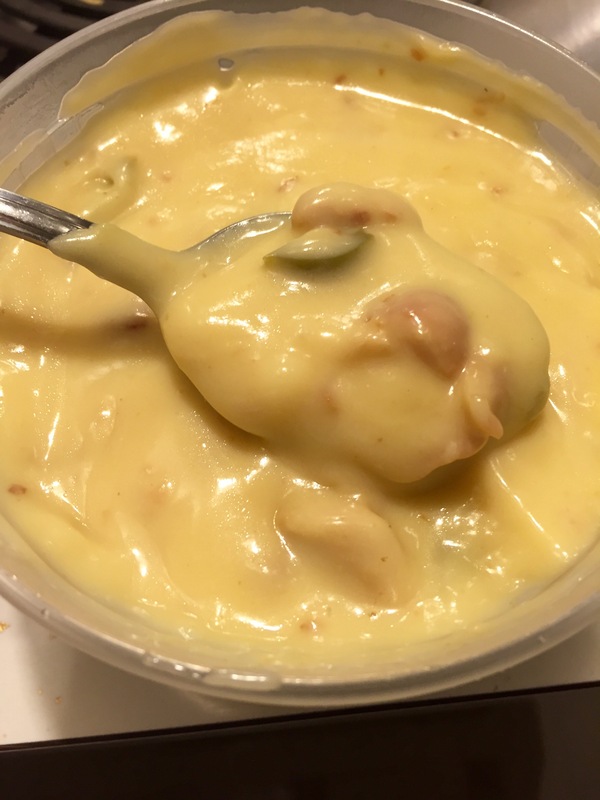 With an almost cream of chicken-like base, this soup had the perfect amount of cheesiness with a subtle hint of beer. There was plenty of smoky bacon bits throughout, and jalapeno added a nice kick – not overpowering at all. 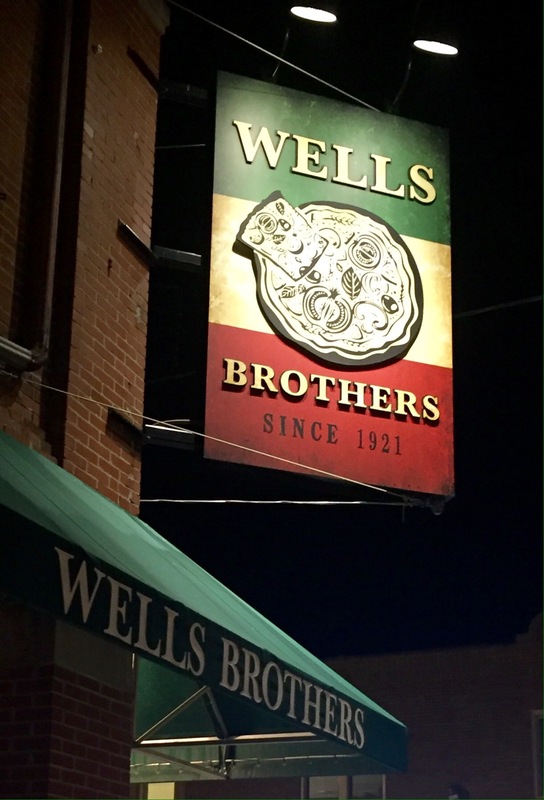 So the next time you stop in to Wells Brothers for a pizza, make sure to taste some of their homemade soup as well. This is Wisconsin — we are the home of cheese and beer —- we are better than this. Gray skies, leaf-less trees and cooling temps tend to put me in the mood for hearty comfort foods. And even though temperatures have been warmer than usual for December in SE Wisconsin, chili-eating weather is here. 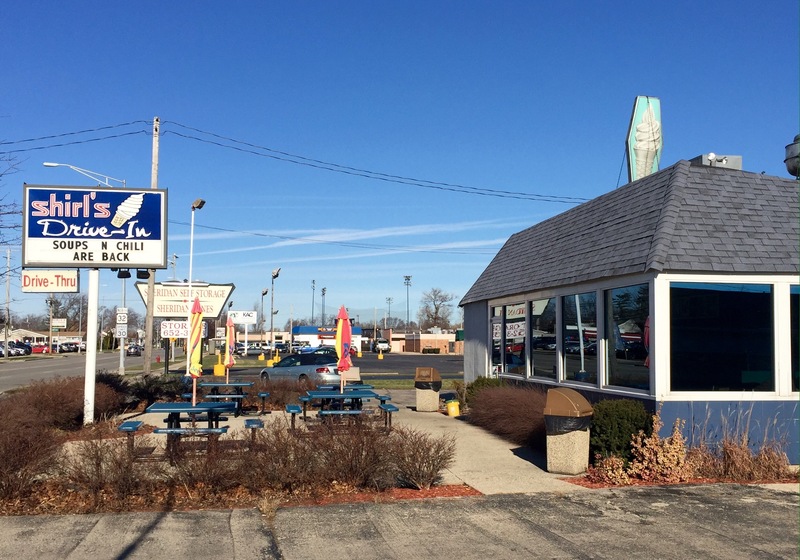 Shirl’s is a popular spot in Kenosha for burgers and frozen custard, and I’m a little embarrassed to mention that I’d never been here before. So, needless to say, I was excited when Shirl’s was mentioned for our chili challenge. The chili at Shirl’s (small $2.79, large $3.39) was decent (I’d say it kind of reminded me of Wendy’s chili), albeit a little inconsistent. One serving was pretty greasy with a really strong oregano flavor and a medium heat level with grilled onions. But a later other serving didn’t seem greasy at all and without the overpowering oregano (yay! ), but had virtually no heat (boo!) and raw onions. Maybe one bowlful was scooped and served without being stirred up a bit first; that’s my theory anyway. We also asked for cheese and onions to be added. I kind of dug that Shirl’s used nacho cheese instead of shredded cheddar. 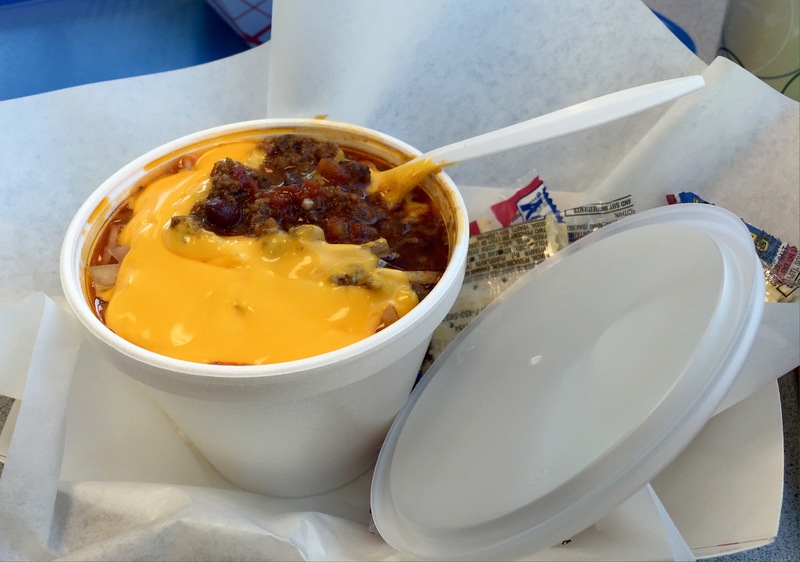 It seemed like a very “drive-in” thing to do, and I wish similar places would offer a cheese choice – shredded or whiz. 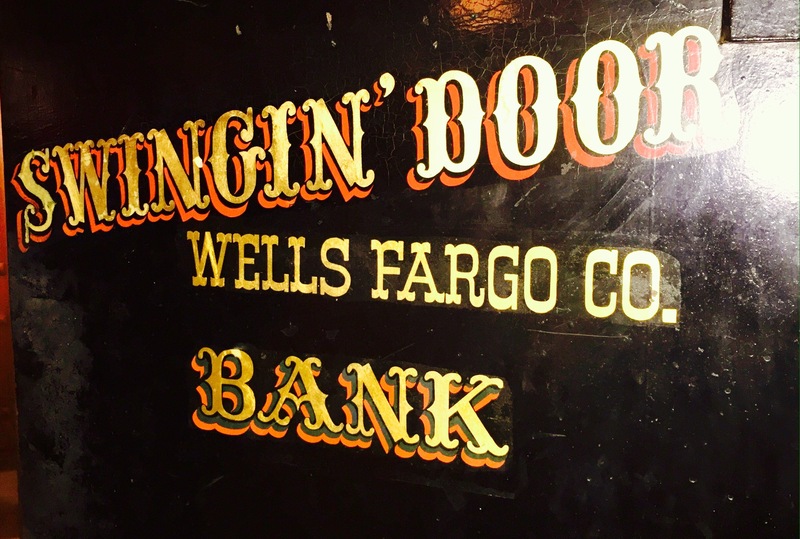 This is a bar/restaurant in downtown Milwaukee that has been slinging drinks since 1931. The vibe was great and the menu went beyond bar food to steaks and complicated salads. This chili (cup $3.50, bowl $5.50 + $0.50 for cheese/onions) tastes exactly how chili should taste. Thick and spicy and meaty with diced onions and peppers and exactly the right amount of heat. Shredded cheddar and diced raw onions were served on the side so you could decide exactly how much of each you’d like to add. 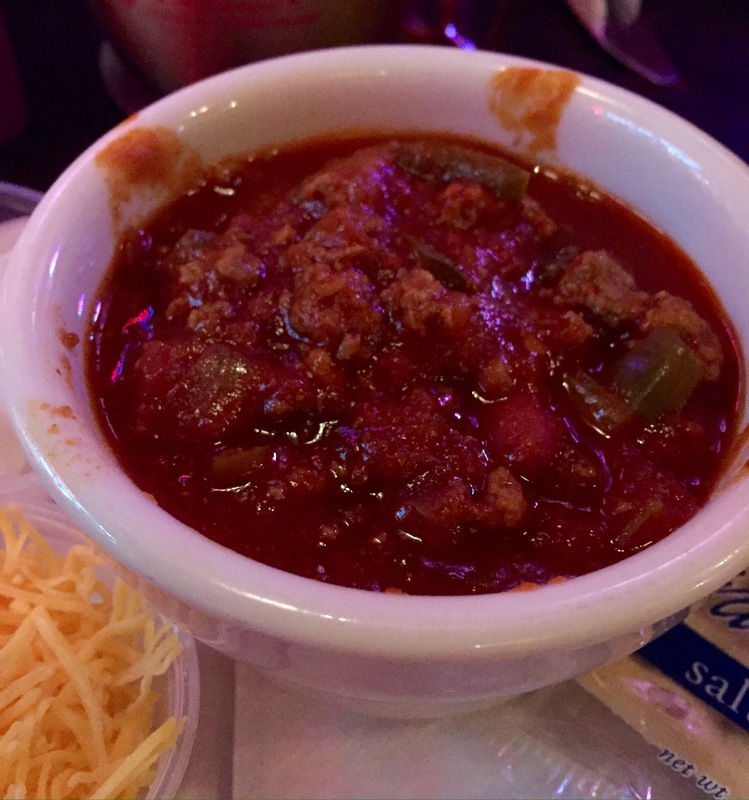 Simply, really good chili. I just want to take a quick sec to talk about what a fun place this is – from the kitschy decor to the delicious Moscow mules to the 70’s and 80’s music that was playing overhead to the waitstaff singing Little River Band songs with us – I cannot wait to go back to this place. Great time! As delicious as the chili was at Swingin’ Door Exchange, the chili at Toad Hall (cup $3.50, bowl $5) is on new level. It’s just so… complex. Smoky, spicy, but also a touch sweet. You can tell after just one bite that this is a recipe that was developed over time. 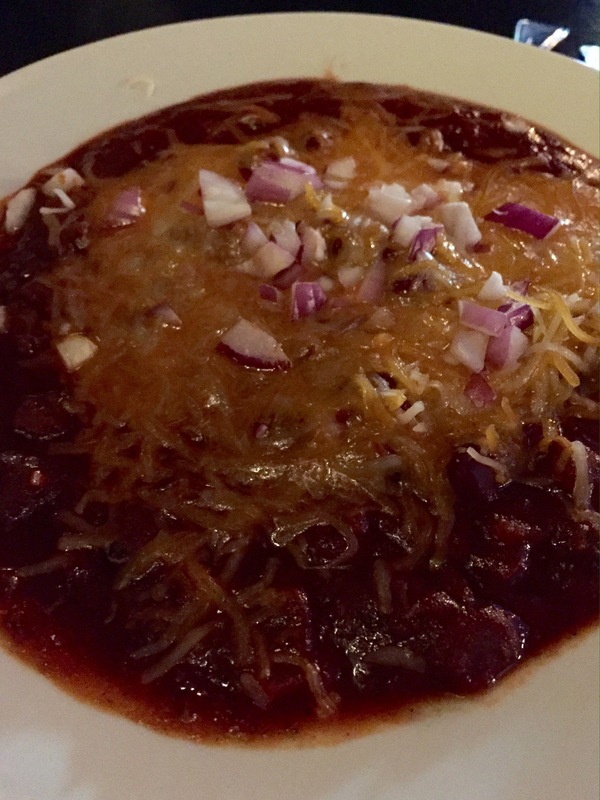 And topped with shredded cheddar and diced red onions – whoa… Corey, Pope of Chilitown, (the creator of the chili recipe mentioned on the Toad Hall menu), well done, sir! 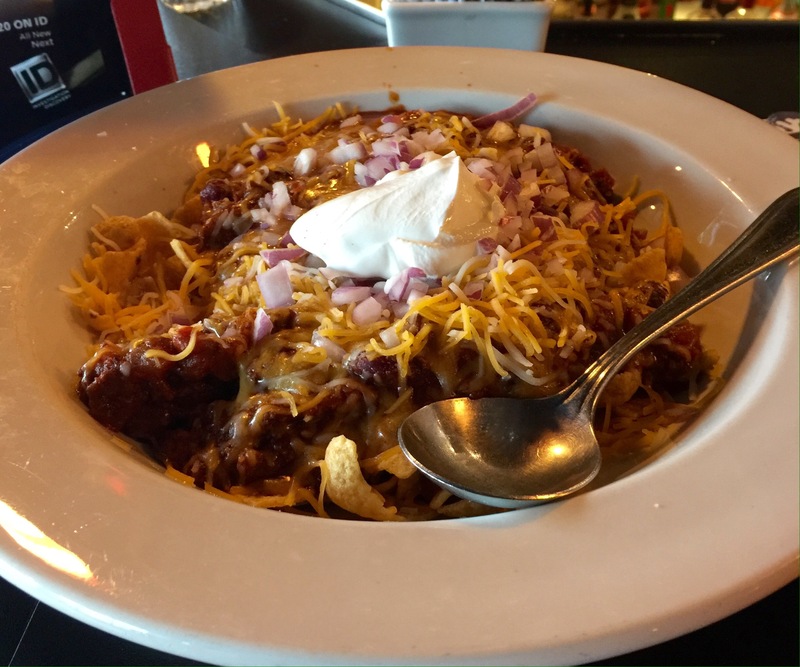 Just to make your mouth water a bit more, Toad Hall also serves up Frito Chili Pie ($7).